This method returns all of the current scan issues for URLs matching the specified literal prefix. The prefix can be null to match all issues. 3. 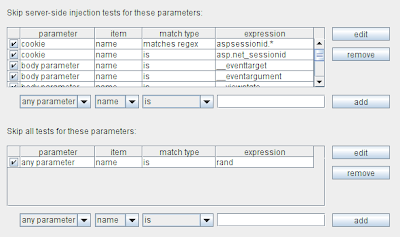 Previously, Burp Scanner could be configured to skip server-side injection checks for specific parameters. This feature is useful to avoid wasting time testing built-in platform parameters that are unlikely to contain vulnerabilities like SQL injection. Client-side issues like XSS are still checked for because this involves hardly any overhead.